Web-Pop Books, created by author Stephen Cosgrove, offers a variety of online and printable books for elementary students. The site is vibrant and colorful with engaging storybooks for kids. Flash Player, Real Player, and Acrobat Reader are needed for some of the options. A low bandwidth version of the books is also available. Stories are grouped into three major categories on the main page. Each category has its own table of contents. Web-Pop Books are sure to engage your young students for hours with interactive stories that teach basic human values. Books in the Book Pop section are produced in Macromedia Flash, but there is a slow connection option. 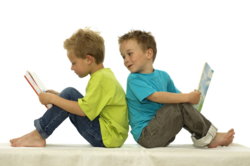 Students can read the stories alone or follow along as the author narrates. Stories in the Story Pop section are audio only and in MP3 format. Additionally there is a download section allowing users to download and print the stories for their own personal library.